The PH5 lamp appeals to everyone. 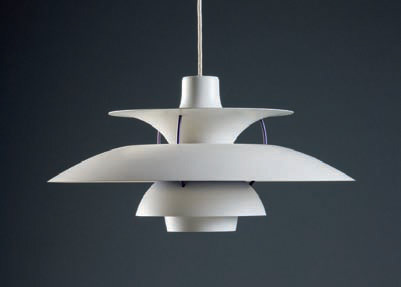 Poul Henningsen was inspired by Communism and was a great opponent of class differentiation. This also came through in his design, which was targeted for industrial production, which in turn would make his products, including PH5, inexpensive to produce and thereby available to the masses. The majority of PH5 lamps today however are hardly everyday objects, but rather sought-after collector’s items with great prestige value - except the PH5 lamp. Even the name PH5 is short and to the point, referring to the diameter of the PH5 lamp of 50 cm. ThePH5 lamp has been part of Danish cultural heritage for generations and very many Danish households across all income groups have today a PH5 hanging at home. PH5 lamps come in many colours; although white lacquer is most often seen. But mauve, red and other colours are also seen at auction now and then. The PH5 belongs to a group of lamps known as pendant lamps, which is why many people call the lamp a PH5 pendant lamp.